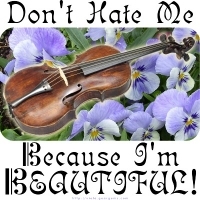 “Don’t Hate Me Because I’m Beautiful” features a gorgeous Viola in a bed of – yes, Violas! Alto Clefs standing in for the “Bs” in the caption will ensure no mistaking this instrument for a vi*l*n (of course,we can say “violin” here, but some consider it unmentionable)! Buy this design now on any t-shirt, hoodie or other apparel, tote bag, mousepad, mug or other quality giftware item exclusively from Bratsche’s Viola Bazaar!